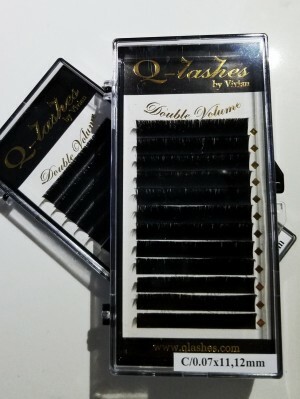 Double Volume lashes will be natural and achieved fuller volume because of the length of lashes is in difference sizes. Easily picked and removed from the transfer strip. Save a lot of time. Q-Lashes handpicks premium quality raw material to make the lashes your clients will be pleased with. They go under strict quality control and are produced under high temperature, making the curl heat and water resistant. You and your clients will be impressed by the difference of silk extensions. 0.07 Double Volume Silk Lash will guaranty retention, glamorous look and many happy clients. 0.07 Double Volume Silk Lash are made blending silk and synthetics to create weightless but strong and durable eyelash extensions.